Apple has revealed the pricing information for iCloud storage plans that will be available this fall when it is launched publicly, presumably alongside iOS 5 and iPhone 5. You’ll be able to upgrade to additional plans either through iCloud.com or on your iOS device. The goal of iCloud is to allow instant and easy access to all of your content and data from all of your hardware, be it a Mac, iPhone, or iPad, regardless of where you are. You can read more about iCloud on Apple.com, in addition to seeing screenshots and demonstrations on how the service will work. Most of iCloud is not currently available to the public, aside from the automatic download feature of iTunes, but the developer beta started today. I look forward to trying this out but honestly I am still confused about why I need iCloud? What is it going to do for me to improve my life? Does this mean that when we purchase music, apps, books and we upload them to iCloud then it doesn’t touch any of our 5GB free storage? Essentially we’ve got unlimited storage for nothing then right? They are referring to media purchased through iTunes, which will be available for streaming upon iCloud’s release, but won’t count against your storage quota. any purchased apps, books, music, and then the pictures you take with your iPhone camera, goes to iCloud for free. It’s data like backups that cuts into the 5GB. Purchased apps, books, and music, and your photo stream, are automatically stored in iCloud, and don’t impact your 5GB free space, yes. So why would anyone want to pay for iCloud… You can backup your iPhone or iPod or iPad through iTunes and then restore it… Or am I completely missing the point of this? but there are always difference. This news is so underwhelming. 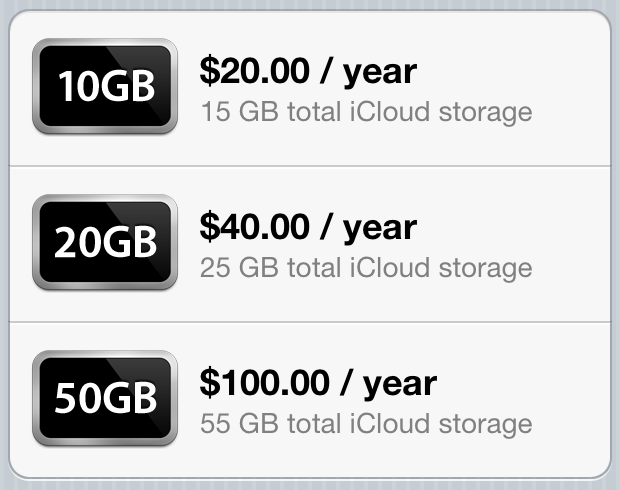 Just like the pricing for .Mac and then .Me, iCloud leaves me wanting and for me, this is a nonstarter. Is it true iCloud will only work with Lion? I don’t get it. Who would need 20-50 GB of storage for Pages, Numbers or Keynote files? Who has 50GB of text docs or presentations? Unless I’m missing something, the iCloud storage is limited to iWork files only. If I could share any type of file like I could with .Mac via a sharing page, then I could see purchasing more space. OK, see, I get most of my music from torrent sites or MP3 download sites…will iCloud work with those too?? lets say you’ve downloaded 20gb of music on your home computer from a site other than itunes. you don’t put all that data directly on the phone because you need storage for other items. if you buy the 20gb plan then you can listen to the music on your home computer no matter what your location. it will stream over the 4g network directly to your phone and all of your phones memory will still be availible. I think you are mistaken about the saving space on your iPhone if you think you are going to stream the music. It is good for accessing what is not synced but it downloads to local iPhone. I too thought that was what they initially were intending. That would have made sense. It is a big premium for access to non-iTunes purchased but iTunes available content that is suffering from a major bottleneck.